This week we focus on migraines. What they are, who they affect, what some triggers are and what to start to do about them. Hannah also details exercise induced headaches–while in a class separate from migraines, they can be extremely painful as well and exceedingly difficult to manage how to separate that pain from a strength and wellness routine. 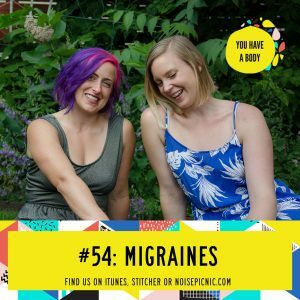 Listen up if you or anyone you know experiences migraines! Like what you’re hearing? Great! Leave us a review in iTunes and we’ll send a personal shout out to you! I am listening and practically crying because you guys are covering so many of the things I experience on a regular basis, that I feel like I have to justify or hide from other people because it seems like it’s ‘ALL IN MY HEAD’ (actually in my head). But, holy crap. Thank you!! CAROLINE! Thank you for commenting and we are SO happy to validate what you experience on the regular. You are not alone, and we’re here any time for you. Big hugs!